Canon introduces their new 50D DSLR. Nikon's new D90 has just been announced. Nikonian arranging a photo shoot to Bulls Island, SC in September. "IT People", and "SLRs are like toothpaste and razors". User submission! 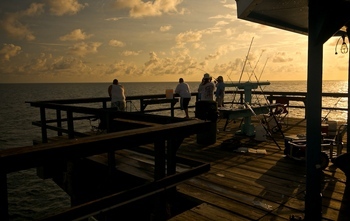 "Fishing at Sunrise"
Nikonians in our D70/D80/D90 Users Group will soon be sharing their thoughts on the new Nikon D90, announced today. Similar in appearance to the D80, The D90 is packed with D300 touches, like the 12.3 megapixel CMOS sensor with an Integrated Dust Reduction System and EXPEED technology. It also has Live View, Scene Recognition with Face Detection, Active D-Lighting, 3D Color Matrix Metering II and the Multi-CAM 1000 autofocus module. The 3-in., approx. 920k-dot LCD has a 170-degree viewing angle. Action shooters can look forward to 4.5 frames per second (shooting Normal Large). Perhaps the most "buzz-creating" addition is the movie function, Nikon's first DSLR with such a feature. It allows for shooting in three different motion JPEG formats: 320 x 216 pixels, 640 x 424 pixels and HD720p (1,280 x 720 pixels), taking full advantage of all your Nikon glass. The autofocus function is disabled while shooting motion pictures and the metering switches to Matrix mode. An optional attachment (GP-1) allows for GPS geo-tagging. This new entry in the Nikon DSLR line-up serves as an upgrade to the D80, announced two years ago, and it shares the same batteries and MB-D80 Multi-Power Battery Pack. Nikon says: "The D90 will be available throughout the United States beginning September 2008 at an MSRP of $999.95** for body only and $1299.95** for body and lens outfit that includes the new AF-S DX Zoom-NIKKOR 18-105mm f/3.5-5.6G ED VR lens. The GP-1 GPS unit will be available in November 2008, and pricing will be announced near the time of its delivery to the marketplace. Nikon's specs are available here. Their pdf brochure is downladable here. Rain can be illustrated in many ways, and Martin covers a few here - and gets a very wet D200 and 70-200 as a bonus. See the images from the wet shoot here - and some other rough (but nice) weather images as a supplement. LaserSoft's SilverFast software for MacOSX. 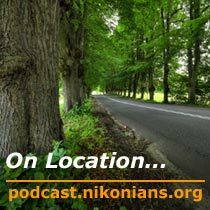 Nikonian looking for members in Mississippi. "Nikon wins a Bronze medal", and "If Nikonia was a nation...". Alleys can provide some really nice subjects - long rows of trees on both sides of a road. But this row wasn't quite as long as it should have been and the traffic was terrible, so getting the calm to shoot it wasn't easy. Images of the packing, Kata bag, neat fleece bags and other practicalities. And of course images from the location. With the Olympics well underway, we're all enjoying the fruits of some really fabulous photography, thanks in no small part of advances in technology. However, it is still the preparatory and artistic work that's doing the heavy lifting, and the Newsweek Visions of China blog captures those moments behind the scenes before the shutter ever gets fired. Be sure to check out Vincent Laforet's August 6th entry, showing the sheer amount of logistical preparation necessary to move six cameras, over thirty lenses and associated support equipment 8,000 miles to Beijing. Or the agony of lost work as a photographer setting up his equipment knocks over two dozen painstakingly positioned remote-fire cameras. Lenovo Thinkpad W700 redefines "bigger-better-faster"
Nikonians with professional photography interests seeking the full-featured performance of a desktop workstation in a mobile notebook can now consider Lenovo's ThinkPad W700. This is the first Lenovo Thinkpad featuring a 17-inch display and that monster screen is just the tip of the iceberg. Once you've tapped into the impressive base Intel Core 2 Duo Processor T9400 (2.53GHz 1066MHz 6MBL2) using the Windows Vista Business OS with a comfortable 2 GB PC3-8500 DDR3 SDRAM 1067MHz SODIMM Memory (2 DIMM) to handle your most intensive graphic needs, you've still got a host of desktop options to add to this dream-mobile. Imagine adding an Ultranav + FPR + Pantone Color Sensor + WACOM Digitizer to a notebook-- and then going to the limits with a ThinkPad Blu-ray Recordable Ultrabay Enhanced (Serial ATA). Lenovo's announcement of the W700 on August 12 tells us they have introduced the "industry's first built-in digitizer and color calibrator to a mobile workstation and combines these innovations with first-in-market technologies such as new NVIDIA Quadro FX mobile graphics and supporting the upcoming Intel mobile quad core processor. 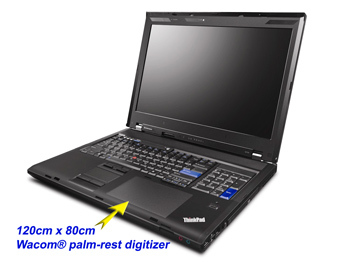 Other features such as optional dual hard drives with RAID configurations, up to 8 GB of high speed DDR3 memory, a range of wireless connectivity options and excellent multimedia capabilities including an optional Blu-ray DVD burner/player make the ThinkPad W700 mobile workstation the standard-bearer for power and performance in a mobile workstation." Lenovo says "The calibrator automatically adjusts the display's color in up to half the time of many external calibrators and with higher accuracy, resulting in the most accurate, true-to-life images in an integrated package. Together with the upcoming Intel mobile quad core processor, multimedia designers and animators now have outstanding quad-core processor performance and true color replication that is critical for realistic digital creations and workflow efficiencies." The ThinkPad W700 mobile workstation will be available beginning in September with models starting at $2,978. It is available through Lenovo Business Partners and www.lenovo.com. Martin Joergensen covers setting up a system for gelling or filtering light from strobes and talks about different ways of using them. Find the blog entry for the Flash Modifier theme on Martin's blog here. A slideshow supplement showing examples of using gels on strobes. Nikonians co-founder Bo Stahlbrandt (bgs) was invited to share his perspective on the growth of photography and imaging communities on the Internet for the first edition of the World of Imaging magazine and Web site. 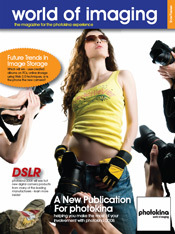 The magazine helps share news and insights about imaging in general and Photokina in particular. It is an "Event Loyalty Media" (ELM) product that is produced in contract by Koelnmesse , the organizer of the Photokina exhibition. You can read Bo's article here. If you come to Photokina, make sure you visit our Nikonians co-founders J. Ramón Palacios (jrp) and Bo Stahlbrandt (bgs) for a chat at our booth: Hall 2.1 E014. 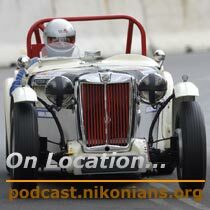 You can also give us a short ping through the contact form at Nikonians. If you want to schedule an appointment to discuss media or marketing opportunities, you should get in touch with Hendric Schneider. Free Capture NX 2 upgrade. New 18mm super wide angle lens from Carl Zeiss. "What Would You Do! ", and "A cure for NAS". At last the rumours have been validated: The new Nikon Coolpix P6000 with integrated GPS and RAW format is out. Good for us who have been thinking Canon G9 is the only way to go. Our Nikonians COOLPIX users group members will soon be busy admiring the newest COOLPIX entries introduced by Nikon in advance of Photokina 2008. 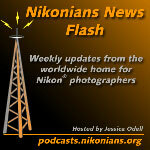 Nikon Inc. has announced the launch of six new COOLPIX digital cameras. The new additions to the COOLPIX product line share features such as the Scene Auto Selector Mode, which automatically selects the right scene mode for the image you are shooting. Also offered in the new line-up are features such as "Smile Mode" which automatically triggers the shutter when a subject is smiling --- and "Blink Warning" which displays a message when it detects that a subject has blinked. The features list gets better with each model -- adding TOUCH-SCREEN interfaces, Wi-Fi transmission and GPS capabilities to your options. Perhaps the most attractive selling point for these new COOLPX models is the price range. The Manufacturer's Retail Price from top to bottom runs at less than $500 U.S. Dollars (USD) for the new P6000 to $250 USD for the S560. The COOLPIX P6000 features 13.5 megapixels, a new, built-in global positioning system (GPS) unit, my Picturetown connectivity and the power of Nikon's exclusive EXPEEDâ„¢ image processing concept, the P6000 offers the perfect photographic tool for photo and camera enthusiasts seeking the creative control of a D-SLR in the compact body of a COOLPIX camera. The P6000 includes intuitive controls via dedicated command and mode dials, providing easy access to shooting controls and exposure mode settings. It offers Programmed Auto [P], Shutter-priority Auto [S], Aperture-priority Auto [A] and Manual [M] modes granting users the ability to tap into the creativity of D-SLR functions while maintaining the simplicity of COOLPIX functionality. P6000 users can also take full advantage of Nikon's Creative Lighting System with the built-in accessory shoe that supports Nikon's i-TTL flash control, which enables wireless control over one group of remote Speedlights including the newly announced SB-900 Speedlight. The P6000 features a quality finish and a front panel constructed of solid Magnesium alloy, as well as a comfortable grip and well-placed controls for streamlined performance. The new P6000 camera is compatible with new high-capacity SDHC cards, and utilizes a Nikon EN-EL5 rechargeable Li-ion battery. It also comes bundled with the COOLPIX Software Suite for editing, organizing and sharing images. The Nikon COOLPIX P6000 will be available nationwide beginning September 2008 at a MSRP of $499.95. The COOLPIX S710 masters the ease-of-use a compact camera and also successfully incorporates many of the functions creative photographers demand from their traditional SLR cameras like Program, Aperture, Manual and Shutter priority modes. Further expanding the Style series of COOLPIX cameras, the S710 features 14.5 megapixels of ultra-sharp resolution, the precision optics of a 3.6x Zoom-NIKKOR wide-angle glass lens and the contours and fine finish of a stainless steel body. The Nikon COOLPIX S710 will be available nationwide beginning September 2008 at a MSRP of $379.95. The COOLPIX S610 blends elegant design and quality construction with high performance and intuitive controls and features. With 10 effective megapixels, a 4x Zoom-NIKKOR wide-angle lens, Optical VR Image Stabilization technology and automated modes like Active Child Mode, the COOLPIX S610 is perfect for consumers looking for a quality camera equipped with powerful photographic tools. The Nikon COOLPIX S610 will be available nationwide beginning September 2008 with an MSRP of $279.95. The COOLPIX S610c is the sixth generation of Wi-Fi enabled cameras from Nikon. Nikon continues to streamline the photo-sharing process through wireless technology, making it easier than ever to share and send pictures without the confines of wires, cables or computers. New to this generation of Wi-Fi cameras, the S610c's wireless service is provided by WayportÂ®, allowing consumers to share their images and videos from over 10,000 locations nationwide including over 9,700 participating McDonald'sÂ® restaurants and major hotel chains. As with previous generations of Nikon Wi-Fi cameras, the COOLPIX S610c can also take advantage of users' home wireless networks to email and store pictures on my Picturetown, Nikon's photo storage and sharing service. The COOLPIX S610c digital camera will be available in Midnight Black nationwide beginning September 2008 with an MSRP of $329.95. The COOLPIX S560,offers 10 effective megapixels, a 5x Zoom-NIKKOR lens, Optical Vibration Reduction (VR) Image Stabilization technology, and 15 user-friendly scene modes, the COOLPIX S560 is the perfect camera for photographers looking for a compact, lightweight camera that is user-friendly with great creative power. The COOLPIX S60 introduces an entirely new, 3.5-inch TOUCH-SCREEN LCD and a new graphic user interface that places shooting and playback controls at the user's fingertips. The COOLPIX S60 will be available nationwide in September 2008 at an MSRP of $349.95. 24:58 Mt. Evans shoot See our shots in this thread on the Podcasts Feedback forum. 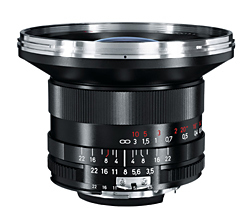 Carl Zeiss has recently announced their newest super wide angle lens. Our Nikonian community members with an appreciation for custom manufactured glass will appreciate their 18mm super wide angle lens for SLR cameras, the Distagon T* 3,5/18. In terms of quality: You get what you pay for. The suggested list price is $1,450 with the standard lens shade, but the incredible optical results available from lenses manufactured by highly skilled manual work and high-precision measuring technology backed by the Carl Zeiss reputation for quality are a major plus. Carl Zeiss describes it as: People are the key to Zeiss quality - people with a lot of experience and know-how mount and align the mechanical and optical components piece by piece to create a valuable lens. Our Nikonians co-founders, J. RamÃ³n Palacios (jrp) and Bo Stahlbrandt were so impressed with the Carl Zeiss F-mount lenses that they co-authored a review, available in a recent edition of our Nikonians eZine (starting on page 35). The Distagon T* 3.5/18 ZF for Nikon F-mount cameras is a lens that may not perfectly meet the needs of Nikon enthusiasts who expect instant total integration with the autoexposure abilities provided by their cameras. It's a manual lens designed for use by professionals with an understanding of the compatibilities of their film and DSLR Nikons. With an impressive field of view of 99Â°, this new, rectilinear lens provides dramatic perspectives for architectural, landscape and close-range photography for photographers utilizing full-frame DSLRs or film-based cameras. For more information about this new lens, please visit: www.zeiss.com/photo. He mingled with the press photographers and shot the celebreties as well as the not so well known, but most of the time he shot cars passing by at high speeds. In this picture supplement you will of course see lots of cars - but also people and surroundings. 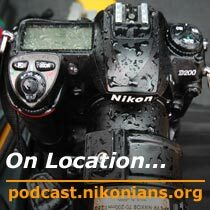 Nikonians (www.nikonians.org), the worldwide home for Nikon users is as of today available in German as well. 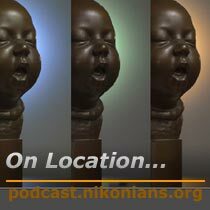 The German version of Nikonians is focusing on supporting members in Germany, Austria and Switzerland. Access to local photography workshops, photo trips and competitions will be provided as the community rolls out localized support for the german speaking countries. Nikonians who purchased Capture NX 1 a month before the announcement of the availability of Capture NX 2 are eligible for a free upgrade. Capture NX 2 was announced on June 3, 2008. If you purchased Capture NX 1 on or after May 1, 2008 from a Nikon Inc. authorized reseller (Nikon product number 25338), all you have to do is call Nikon at 800-Nikon-UX (800-655-6689) with your product key and be ready to provide a copy of your proof of purchase to receive a Capture NX 2 key code free of charge. Additionally, if you happen to purchase Nikon NX 1 from a Nikon Inc. authorized reseller (Nikon product number 25338), anytime from now until December 31, 2008, you will still be entitled to receive a FREE Capture NX 2 Upgrade directly from Nikon. Due to high demand, we've just opened up one more session of our D300 workshop in Raleigh for this Thursday, August 7th. The first session on Friday was completely sold out, so we added an additional session to meet demand. If you are in the Raleigh area this week, then please consider attending the workshop. You can sign up here: www.nikoniansacademy.com. Have you picked up the new SB-900 flash yet? It is a thing of beauty and represents another solid leap forward in flash technology. One of the best things about the new flash is the much improved user interface that makes it easier to select the shooting modes. Now we are able to flip a switch rather than go into a hidden menu to change between wireless commander mode or wireless remote mode. Even with the easier to use interface, it is still a complicated system and we are receiving lots of requests for help with setting it up. We are modifying our iTTL flash workshops to incorporate the SB-900 into the curriculum. Of course, we'll need a few weeks to rewrite the content, but we've got you covered. Look for a flash workshop coming to your town in the near future. Speaking of new products, the Nikon D700 is an amazing new camera and we've had a few weeks to work with this new body. The FX sensor and the resulting high ISO performance is nothing short of extraordinary. We love the ergonomics, the usability and the speed. It truly is a professional level camera system and we can't wait to start leading workshops on it very soon. How does a few days of shooting the austere landscapes in Death Valley sound? This November we have a special four-day travel workshop planned for one of North America's most amazing landscapes. Join Associated Press Photographer Michael Mariant as he leads you through Death Valley's Dante's View, Badwater, the sliding rocks, and Stovepipe Wells. Michael even has a trip planned to one of his secret locations called the Gnome's Workshop. Sign up now at www.nikoniansacademy.com. "Can anyone tell the difference between a film and a digital image? ", and "If it were available, would Ansel Adams use digital?". Nikon has apparently withdrawn sponsor support for Microsoft's Iconic Britain photo contest due to the software manufacturer's lack of diligence in supporting copyrights of the submitted images. Led by the website Pro-Imaging, a notice was sent to Microsoft to change the terms and conditions of the submissions sent into the contest. Originally, the images would be drawn from the archives of Microsoft's Live Search - participants could pick any images from that collection, regardless of whether they were under third-party copyrights or not. According to Pro-Imaging, "...implication is that Microsoft have not excercised any care over the Live Search feature with regard to whether the images are under third party copyright or not. By allowing entrants to select such images and post them on the Microsoft website they are enabling the entrants to infringe the copyright of the image creators." (spelling errors are accurate - this was taken verbatim from the web-site being quoted). The 2008 Digital Camera Usage and Satisfaction Study by the prestigious consumer rating firm J.D. Power and Associates finds Nikon and Canon in a tie for the highest rankings in customer satisfaction for the digital SLR camera category. Specifically, the Nikon D series was noted for performing "particularly well in ease of operation, performance, and appearance and styling." Congratulations to Nikon! Nikon is offering a hardware upgrade to it's flagship D3 digital DSLR. The improvement doubles the effective buffer of images and makes the camera even more appealing to sports and action shooters. With any luck, there may be some fortunate Olympics shooters this month enjoying the fruits of both full frame and a deep buffer. Reminscent of the D1X buffer upgrade of 2002, the current offer allows D3 owners to double the image buffer count in continuous shooting; instead of sixteen (16) 14-bit RAW uncompressed images, photographers will now have a thirty-six (36) image count. The improvements will also cascade down to the JPEG formats accordingly. The upgrade will cost USD500/323 Euros and the service was made available as of Wednesday (30-July-2008) for US owners. The camera will have to be sent in for the service.